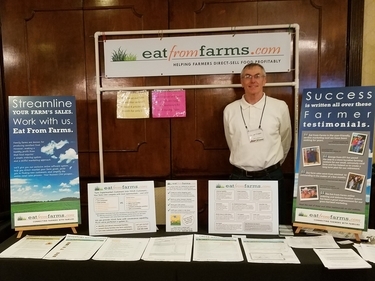 "Helping Farmers Direct-Sell Food Profitably!" Since 2013, Eat From Farms (EFF) has been providing farmers with a time-saving online system. It simplifies much of the work associated with selling farm foods. It's NOW available at a cost EVERY farm can readily afford --- $9 per month! You can develop an attractive, mobile-friendly website on our EFF system. Or you can add our system to your current website. No computer tech person is required. The system has been designed to be used by anyone who can access the internet. Changes can be made at will. Live updates occur as soon as they are saved. 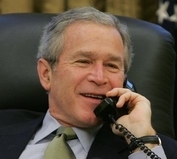 Answers to questions are a phone call away. 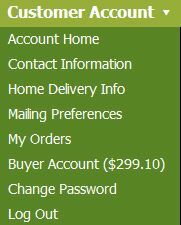 At a cost of $9 per month, why wouldn't you give your visitors an opportunity to place an order? If it's midnight or 6 AM, no one is going to call you. In fact, most won't make the effort to call or compose an email, regardless of the time of day. And if they don't place an order while on your site, there's a good chance they never will. Question: How many times have YOU found a website that interested you, vowed to return "when you had a chance", and never made it back? 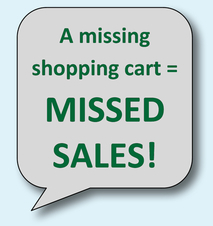 When selling farm foods, a missing shopping cart = MISSED SALES. Fortunately, we offer a $9 per month solution that is easy to deploy and use! Your EFF shopping cart system is open for business 24/7. Include as many products as you want - no limits. Turn seasonal products on and off with a click so they don't clutter up your offerings when not available. In addition to simply selling food, the EFF platform can be used to build email lists, encourage market pre-orders, attract new customers, develop buying clubs, simplify wholesale ordering. Most of all, our farmers use it to add convenience for customers, and for themselves. Ordering and order processing become much more organized and automated, dramatically reducing the juggling of phone, email, and text messages. A post hole digger doesn't build a fence for you, but it sure makes the job easier. The same is true of our EFF system. It's an invaluable tool that makes the whole process of selling farm food easier. The inventory you make available for online ordering updates in real time. As orders are placed, available quantities are instantly reduced. "Out Of Stock" appears for any products which reach a quantity of 0. As a result, customers can submit orders, knowing what they want is in stock. And they can't order more than you have available. Our database-driven inventory system eliminates many headaches. In the masterlist image below, each number on the right is the current available quantity. As new stock becomes available, quantities are updated for any or all products. The revised inventory can then be saved with a single Save Information click in your Inventory Manager. Our programming and automation handles that for you. Customers place orders based on the approximate weights you preset for each type of item (see images above and below). When you fulfill an order, you type the actual product weight (0.84 in image below) into the order page and save it. Our automation immediately updates all the math. When you have finished with the order, the "Finalize" button is clicked. That triggers a detailed email with correct pricing to be sent to your customer. A detailed invoice is also recorded in their Customer Account. If it was a credit card order, the card is automatically processed for the correct amount and confirmed as paid. With Farm Pickup, customers can order from your inventory at any time. Pickup is individually arranged to work with your schedule. If you want to have scheduled pickup times at your farm, you can set up your farm location as a delivery location, while turning off the Farm Pickup option. In your EFF account, you can set up as many delivery locations as you need. For each location, you schedule delivery dates and times. Cutoff times you preset prevent last minute orders. Many farmers set up their Farmers Markets as delivery locations to encourage pre-orders. We've created postal mailings for others to germinate new delivery locations in targeted neighborhoods. For each specific location and delivery date, our programming automatically groups all of the orders for simple processing. It also creates a pick list and other order fulfillment and delivery aids (see image below). Some EFF farmers offer home delivery for an added fee. There is built-in support in the EFF system for that service as well, at no extra cost. Marketing as a group has many advantages, so we've created tools to make it easier. You can set up an unlimited number of free subvendor accounts to add non-competing food options to your online store. In fact, you can create an entire online farmers market under YOUR control. Subvendors manage their own online inventory from their own login. They receive notices when their products are included in orders. They also have their own pick lists for delivery location orders. Our automation makes vendor communication seamless. Customers placing online orders automatically have a Customer Account which maintains copies of their invoices, as well as delivery location and mailing preferences. Our system automatically tracks your customers and compiles your group email lists by delivery location and in a master list. You can offer customers up to five payment options when placing orders - online and in-person credit cards, cash, checks, and draws against a pre-paid Buyer Account balance. Simply turn on the options you want to offer. Online credit card processing cost is 2.9% plus 30 cents per transaction. There is no monthly fee or hardware to buy. We offer full phone and email support to all our farmers. We can do that because our system is very easy to learn and use. If you need help, call or write to us with details. Your cost to offer online ordering through our EFF platform, with all our time-saving automation, is only a $9 per month account fee! It doesn't matter if you add on to a current website, or if you use our integrated website builder to create or convert your website. Either way, for $9 per month, you can have our shopping cart system available for customers. The signup cost is $36. That covers the account fee for the first four months. We also have an EFF referral program --- refer other farms to us, get a 3 month ($27) credit. You will be contacted to confirm your order before your credit card is charged. Through our experiences with other farmers, we can often offer marketing guidance on what does and doesn't work when it comes to attracting customers and selling farm products. We also create full color mailers for EFF farmers wanting to establish a delivery location in a targeted neighborhood. We handle the design, professional printing, postage and mailing. In quantity, the total cost is under 40 cents per mailer. Like to develop new customers and a delivery location in a particular neighborhood? One of our mailers could be your answer. Today, most people expect to have the opportunity to order products online. If you don't offer that convenience, you're losing some orders. You can spend good money for a typical shopping cart system that doesn't work well for most farm products. Or, you can use our system. It was specifically designed to handle the unique needs of most farms..
And, with a $9 monthly account fee, even the smallest of farms can readily afford it. PLUS, we have a farmer referral program. We offer a $27 (3 month) account fee credit for any EFF farmers or vendors you refer to us. Beyond that, it may be available without cost if it replaces a hosting fee you currently pay for a website. It will surely reduce your cost if you currently pay a web designer to make updates on an existing website. As I edit this in late March 2019, we are working on a major website builder upgrade to be released in the next few months. It will allow fantastic flexibility in appearance, as well as being completely mobile friendly and modern looking. Our EFF farmers are reaping benefits. In each case, it started with a conversation about their farm business. Or if you'd rather, click here to write to me instead! Now it's YOUR opportunity. Tell me about your farm, and let's see what we can do together. Now is the time to consider alternatives for 2019 and beyond. Call me right now, even if it's 2:00 AM. If you put it off until "later", it's likely you'll never make the call. Don't make that mistake. Opportunity is knocking. Commit to investigating our EFF service by dialing 518-326-1638 now (don't text). You have nothing to lose and much to gain. If that's too scary, then write to me instead.